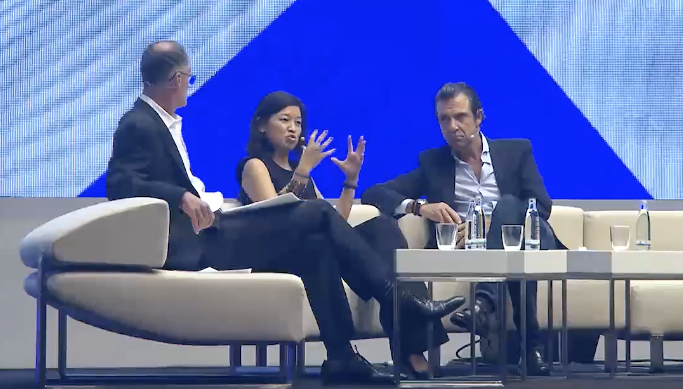 In a lively panel discussion on day two of DMEXCO, Rahmyn Kress, CDO of Henkel, Deborah Koyama, CMO (Europe) at Mondelēz, and Geoff Ramsey, Chairman and Co-Founder of research specialist eMarketer, debated the different ways a business can undergo that inevitable digital transformation journey. While technology is vital for the digital transformation that business needs to make now, it is by no means sufficient. There is a culture and systems challenge to tackle along that journey. Ultimately, the end goal can only be reached with the support of the ‘3Ps of digital transformation’: people, process, and partnerships. “My mission is to unlock the talent in [our] organisation, as well as ignite the powerful portfolio of brands that we have at Mondelēz,” says Deborah Koyama, elaborating on her personal mission to build capabilities and drive digital talent across snacks brand Mondelēz. Her work to increase digital skills within the marketing department includes the launch of a digital accelerator and Koyama is subscribing to the “70/20/10 rule” to help embed digital knowledge within the organisation. Commonly used by L&D teams when rolling out strategic training programmes, the 70/20/10 methodology of learning states that while 70% of learning happens on the job and 20% happens through social interaction, the 10% – what we at Circus Street believe to be the most vital part of any training programme – is the essential knowledge injection, gained from formal training. Koyama believes that 10% is vital for her teams: “I love the 70/20/10 approach, because we still have to help the business run […] so we’re going to spend time, resources and people on the 70% and continue to innovate – which we do a lot at Mondelēz – but to push us and leap us forward to the future, I believe a lot in the 10%”. It is all very well training up your talent to leverage new digital technologies but if you don’t change the way your organisation operates then your transformation journey may well grind to a halt. Businesses can really advance their digital transformation by empowering employees to change certain processes within organisations. “You need to help, you need to encourage, you need to give trust,” argues Kress. Collaboration is critical. Henkel’s culture, explains Kress, incorporates a drive to collaborate and learn from different business units. “In our case we have three business units and we have a lot of innovation and transformation going on,” he says. “To learn from one another, to find those cases that work really well, [to] share those experiences of something that hasn’t worked […] is paramount”. More than just a buzzword, the time for Digital Transformation is here, and that poses a real challenge for many businesses. Understanding the threat and embracing change can be the difference between surviving in this digital world and getting left behind. For more insight into the challenges and opportunities that Digital Transformation brings, check out our lessons on the subject here or check out our Digital Transformation playlist on our YouTube channel.